The fantastic HIGH-RISE, which we previewed back in March at Broadway with special guest director Ben Wheatley, is coming to home release from 18 July - with digital downloads available from 11 July. Adapted from JG Ballard's novel HIGH-RISE is a savage and utterly brilliant satire of both 1960s social idealism and the Thatcherite values that undermined it. Featuring an all-star cast led by Tom Hiddleston and including Sienna Miller, Luke Evans, Elisabeth Moss and Jeremy Irons, and with an original score from Clint Mansell and an unforgettable cover of ABBA's "SOS" by Portishead, HIGH-RISE is already one of the best films of the year. And to celebrate the release of the film on DVD and Blu-Ray*, we'll be running a competition on Twitter to win a copy of the film on Blu-Ray, a poster, a t-shirt and a set of badges. Come and follow us @mayhem_festival for more details. We know it was a little tricky to find out all you needed to know about Mayhem in the past, so we've created this new platform offering easy access to essential information about the festival, as well as its history and legacy. We hope you will enjoy it as much as we do. We're currently working on this year's festival - our 12th edition (!!) - and we have a couple of announcements to make. Firstly, our Early Bird passes are now available to purchase! Early Bird passes give you access to the full festival, which will take place at Broadway, Nottingham on 13-16 October 2016. The passes are available for a limited period of time and cost just £60 for four days of exciting previews, special guests and events, showcasing the best horror, sci-fi and cult features and shorts from around the world. To purchase an Early Bird pass, please click HERE or contact the Broadway box office on 0115 952 6611. That's all for now! We will bring more news about this year's programme very soon. You can sign up to our newsletter if you would like to receive all of our announcements straight into your inbox, or just keep an eye on our website. It's time to save the date! Mayhem Film Festival will return this autumn at Broadway from 13 – 16 October. With previews, premieres, special guests and midnight screenings, Mayhem Film Festival showcases the best in horror, sci-fi and cult cinema, through feature films, short films and special events. In previous editions, Mayhem has welcomed many filmmakers such as Nicolas Roeg for a special screening of Don't Look Now at St Mary's Church, Ben Wheatley for a preview screening of Sightseers, Gareth Edwards for Monsters, and Mark Gatiss (The League of Gentlemen, Sherlock) for a special masterclass. 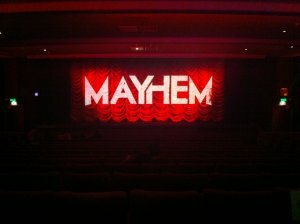 Mayhem Film Festival has also hosted exclusive events such as screenings with specially-commissioned live scores from 8MM Orchestra, and a one-of-a-kind live reading of unmade Hammer Films screenplay, The Unquenchable Thirst of Dracula. Now in its 12th year, the festival has grown from a single short film programme to a four-day event and continues to expand its programme to highlight emerging talents and new bold titles from the darker edges of film. Planning is currently underway for Mayhem Film Festival 2016 with more information and announcements coming soon. Submissions for feature films will open in the spring. Mayhem Film Festival will take place at Broadway, Nottingham on 13 – 16 October 2016.